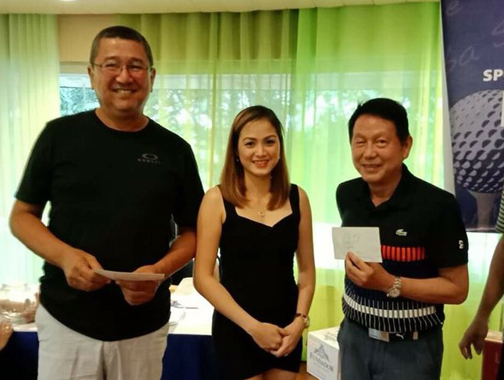 George Cabarrus topped the Class A Division at the recent Letran Alumni Association Arriba Cup Golf tournament held at the Forest Hills recently. Photo shows Cabarrus getting his prize from LAA Board Director Winston Chan, assisted by a Tanduay promo representative. “We are happy with the turnout of entries as this shows the strong support of our alumni for our programs aimed at raising funds to support our future athletes or to help those graduates who have fallen into hard times,” said Alex Wang, Chairman of the LAA Sports Committee, which in the past has been holding basketball tournaments and clinics as part of the group’s developmental programs. Other winners in the golf tournament that had LAA President Ali Cruz as Tournament Director were George Cabarrus in Class A, with Bobot Marquez and Allan Rubrica as runners-up; Class B champion Wayne Tee Ten, with Buds Nero and Leslie Agoncillo taking 2nd and 3rd places, respectively; and Group C ruled by former basketball player Alvin Magpantay, followed by Molet Abogado and Marian Herrera. “The LAA will continue doing its role as a partner of the school. We have lined up more activities for our alumni this year,” added Cruz.